Apr. 13, 2018 — To say that Natalie Larson ’06 is a renaissance woman is an understatement. After graduating from Grinnell College with a degree in studio art, she briefly returned to school to study philosophy, then switched directions and earned a second undergraduate degree in math and computer science from Vanderbilt. 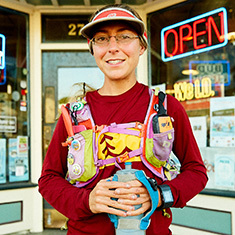 She’s also an ultrarunner who has completed a dozen 100-mile races, as well as several 50k and 24-hour running events. 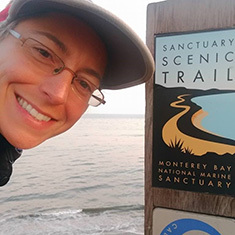 Last year she ran/walked the California Coastal Trail, a 1,171-mile route spanning the length of the state, from Mexico to Oregon. Carrying her own food and water and traveling alone, Larson completed her journey in 44 days and set the fastest known time (FKT) for the trail. Now back home in Riverside, California, Larson is starting a new job at the Naval Surface Warfare Center in Corona, California, where she’ll specialize in machine learning for cyber security. The Navy paid for one year of her master’s degree in computer science from University of California, San Diego. In between her training sessions and yoga classes, Larson answered some questions about her latest accomplishment and her time at Grinnell. A: I’m training for Spartathlon, a 153-mile race from Athens to Sparta. It follows the footsteps of Pheidippides, the Athenian long distance runner. You have to do it in 36 hours, and a U.S. national team is going. I qualified for the team by completing a 100-mile race in 17 hours, 24 minutes. Q: What have you taken from your time at Grinnell College that has helped your career and your ultrarunning experience? A: I felt that Grinnell encouraged creativity, an open mind, and striving to achieve great things. It helped nurture those values in me. I felt supported at Grinnell, that my professors believed in me, and that I could achieve what I set my mind to. Grinnell's focus on social justice probably also helped me as I went against the grain as a woman in science, and a woman hiking 1,200 miles alone. 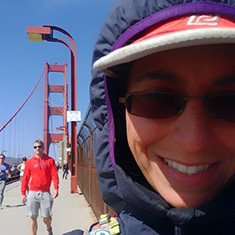 Q: Was your California Coastal Trail run the hardest thing you’ve done? A: It was so much fun. I wouldn’t say it’s the hardest thing I’ve ever done though. I could have pushed myself more, but my first goal was to finish the whole thing, and I didn’t want to get injured. My sleep quality wasn’t good because I was camping most nights and sleeping on hard ground. And the whole time I felt pressure to keep going as fast as I could. I had to plan each day where to get water, and where to get food and sleep. I also had to keep my phone charged because it had PDF maps of the route. If I was going to do it again I’d find a better way to carry the maps. Ideally, I would have found a hotel, charged my phone overnight and slept really well, but I was trying to save money and stay near the trail. Q: Did you ever consider giving up? A: There were only two times when I questioned it. The first time was in Los Angeles. Earlier that day I’d made a wrong turn in Long Beach and did an extra four miles. I got to a hotel, it was late, and my muscles were so sore that it felt like I’d just done a 50-mile race. Luckily, the next morning I felt pretty good. After that my body adjusted to doing 200 miles a week. The only other time was toward the end, when I was talking to my parents on the phone after they’d gotten to Oregon to meet me. I was exhausted and still had a long way to go. But I don’t think I ever really thought I would quit. Q: How did you break up each day? A: My mileage goal was 30 miles a day, because on the first day I ran into a famous hiker who told me I needed a goal. At the beginning there were some 40-mile days, but at the end I was getting worn out. It was getting cold toward the end since it was October. The last 24 hours, I covered 41.3 miles without sleeping because I wanted to finish it. Q: How did you get into ultrarunning? A: I started doing marathons in 2004 when I was at Grinnell. I was inspired by an aunt and uncle who were marathoners. But it sounded like more fun to run farther than to get faster, so I trained for my first 50k in 2010. Q: How did you balance all that training with school and other commitments at Grinnell? A: I always felt like running helped me in school. I got that runner's high and felt healthy and good after my run in the morning. I still remember the cross country coach, Evelyn Freeman, saying that students who participate in sports in college on average do better in their classes. It was a kind of meditative time. I would listen to music while running and it would put me in a good mood, and I could plan out my day. One of my Grinnell friends was shocked when I told him that getting in my run was my top priority every day, but I really think those runs helped me to be a better student and person. Embarrassingly, I also remember wearing my first marathon finisher medal around all day at Grinnell! Q: Are you glad you took this challenge on? A: I couldn’t have predicted all the people I’d meet. And I felt so close to nature – it’s such a different perspective than being in our normal world. So much of it was parks and beaches and it felt a lot closer to God and nature. I want to do it again – some day. Larson chronicled her journey through her blog. For more photos and a daily description visit http://natalielarsoncct.blogspot.com/.